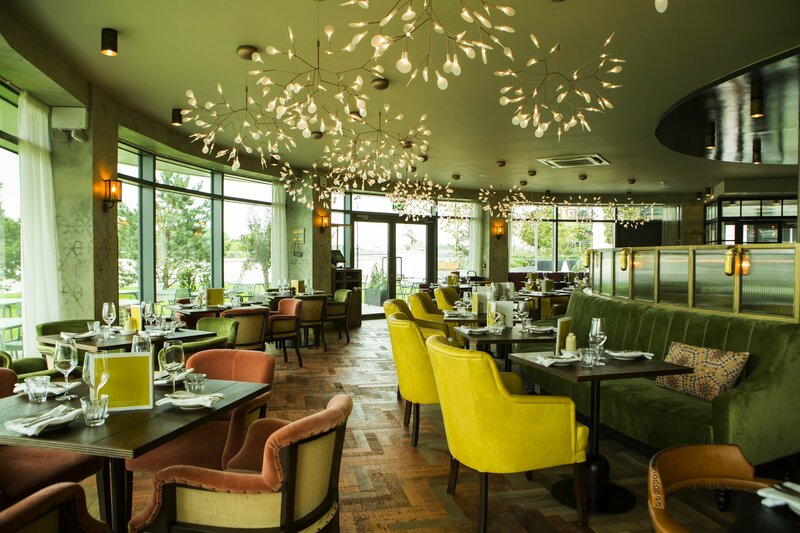 Brasserie Blanc, the collection of French brasseries led by Raymond Blanc has recently opened at its newest location in Fulham Reach, offering a stunning riverside bar, restaurant and terrace. In a light and modern space, Brasserie Blanc Fulham Reach furnishes classic French dishes (think duck leg confit with black cherry sauce, or beef bourguignon) alongside more contemporary options. To reaffirm our culinary romp of culture, we at Vada Magazine paid a visit. 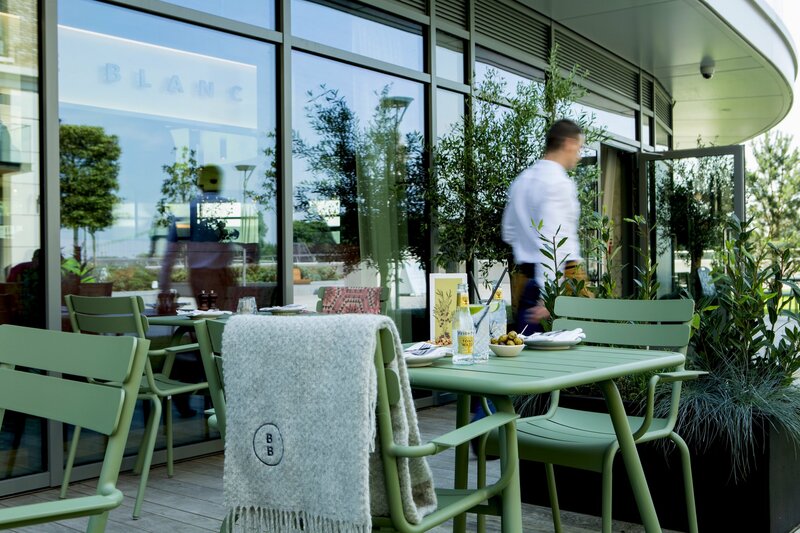 The first thing to notice on arrival at Brasserie Blanc Fulham Reach is the mint-coloured outdoor furniture on the terrace surrounding the curvature of the building. This softens the contrast between floor-to-ceiling glass walls and green surroundings. Facing the Thames, Brasserie Blanc allows guests an ideal location to stop and admire rugged runners speeding past on the river path. Inside, eye-catching Moooi Heracleum lights follow the shape of the building, whilst copper herringbone parquet flooring brings a shimmer to the open plan dining space. An open kitchen pass allows diners to see Brasserie Blanc’s skilled chefs in action; but we preferred an outward view towards the river. Also open for weekend breakfasts, morning coffees and leisurely lunches, we visited Brasserie Blanc for dinner. We started with the Green papaya salad, which doesn’t contain any actual papaya, rather is made with mixed designer leaves, mint, coriander, and cashew nuts and brought together with a Thai style dressing. We had ours aside some butterflied chargrilled chicken (£8.90). 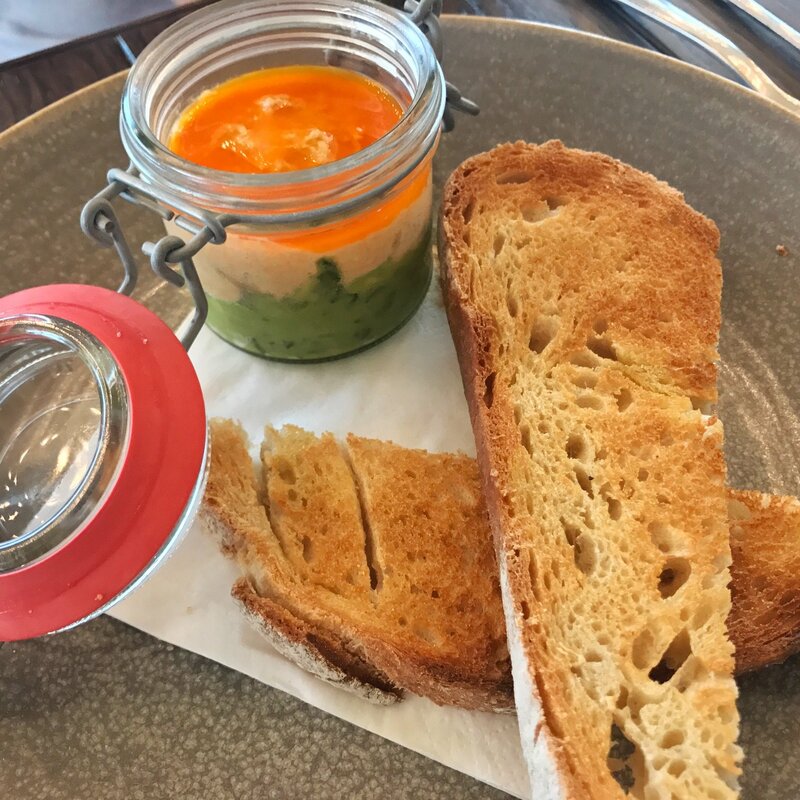 We also oped for the Potted Cromer crab, served in a conserve jar with avocado, prawn butter, and sourdough toast (£9.50). The salad, light and fresh, dressed just enough to add the Thai flavours without drowning the leaves. 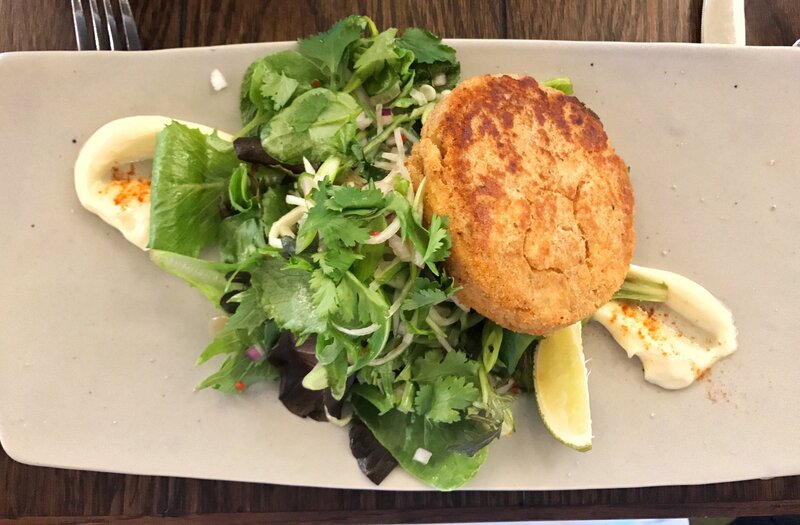 The crab, a well-presented, smooth combination of flavours. French bins take centre stage on the wine list, although there are some other international options. If it’s a celebration, or any other occasion that calls for bubbles Brasserie Blanc have their own Blanc de Blancs sparkling bottle. Keen-eyed diners will also spot the gin trolley – we need one of these in the Vada office, as do a few airlines whilst on that subject. The trolley is stocked with a wide variety of gins, from classic London dries to fresh and floral varieties, for a G&T to your exact specifications. For our meal however, we chose the bottle of Sancere from the Loire valley (£38). The notes of gooseberry and ripe lime paired particularly well with both starters. By way of main course, a salmon and crab fishcake was served with a small portion of green papaya salad – this time with added chilli and ginger, and a moreish lime mayonnaise (£16.50). We added a compulsory side of French fries (£3.90). 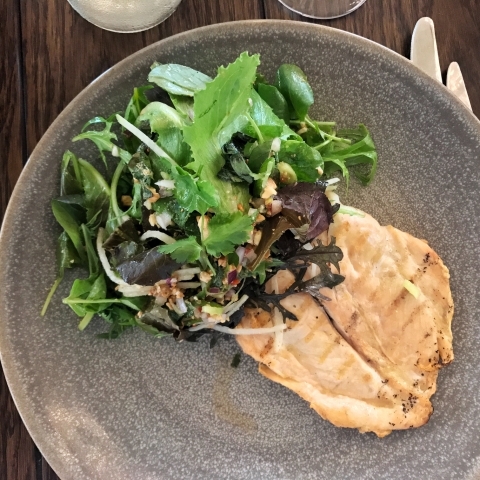 Whilst we can recreate this kind of meal in the kitchen with significant labour, Brasserie Blanc produce an effortless plate. 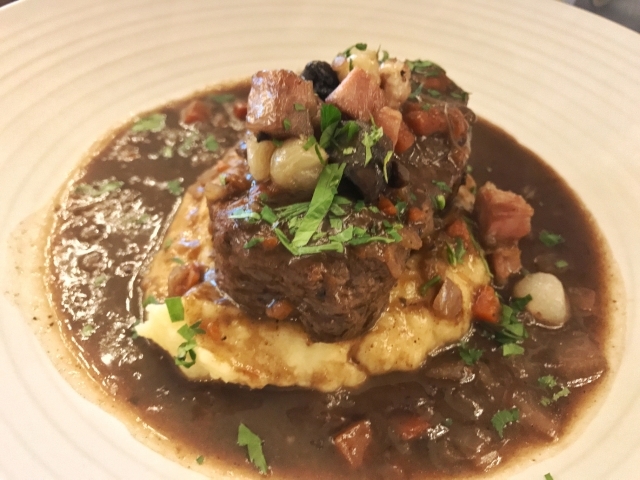 The traditional French classic, Beef Bourguignon (i.e. slow cooked beef in red wine, lardons, baby onions and mushrooms) was our other main course choice (£18.55). 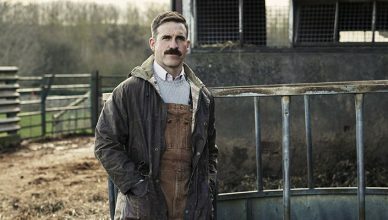 Served with creamy mash and a side of mixed heritage carrots (£3.90), the beef was tender and a welcome wholesome meal offering succour to a grumbling stomach. For desserts, we were tempted by daily special of pavlova with chestnuts; however the allure of chocolate persuaded us to the Chocolate Delice. 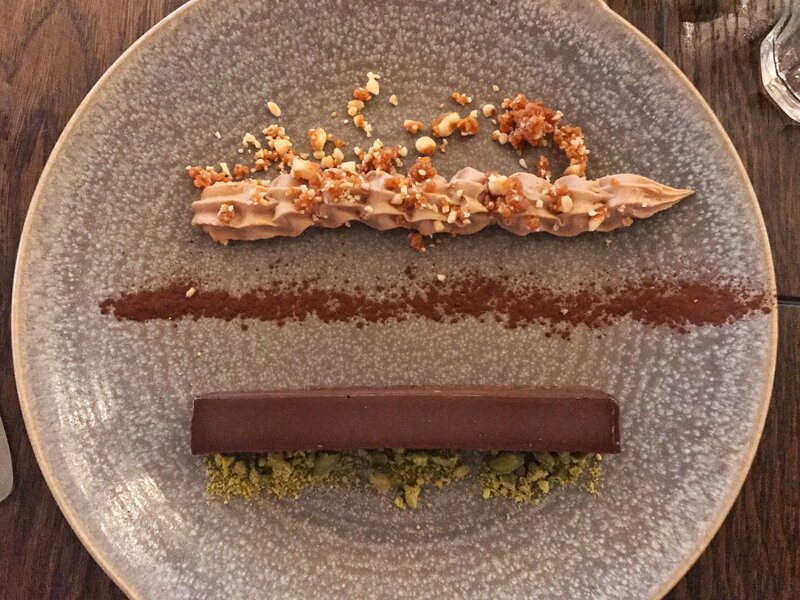 This rich chocolate mousse served on a crispy base, served with a Kirsch-infused pannacotta cream, and crush caramelised hazelnuts (£6.75) was chocolate heaven. 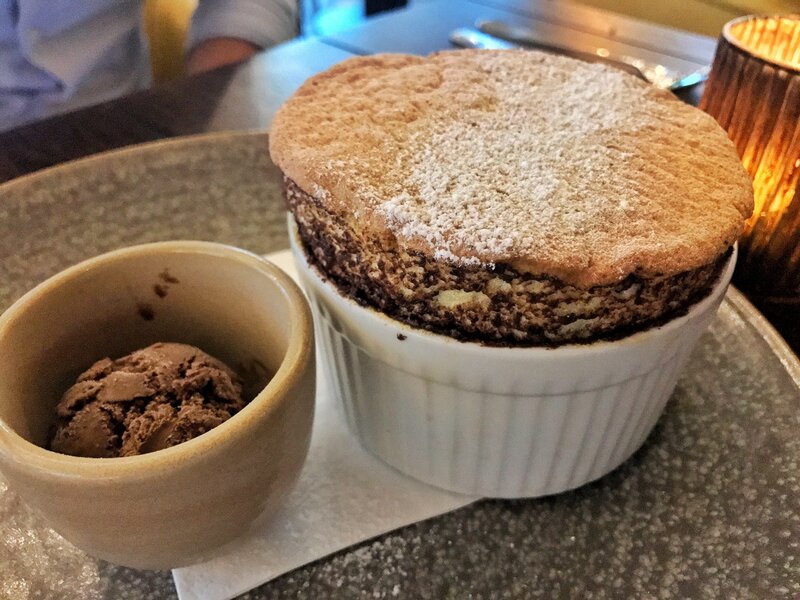 Pistachio soufflé is the choice for anyone who suffers from restaurant FOMO or food envy. That green-eyed monster is akin only in colour to the infused pistachio green colour of the soufflé, served in a chocolate lined ramekin, with chocolate ice-cream (£7.50) – yes, more chocolate. We would go as far as to say that any kitchen that does not offer at least one cacao-based dessert is skating on exceptionally thin ice for success. The well established Brasserie Blanc brand continues to be a success at this latest London location. 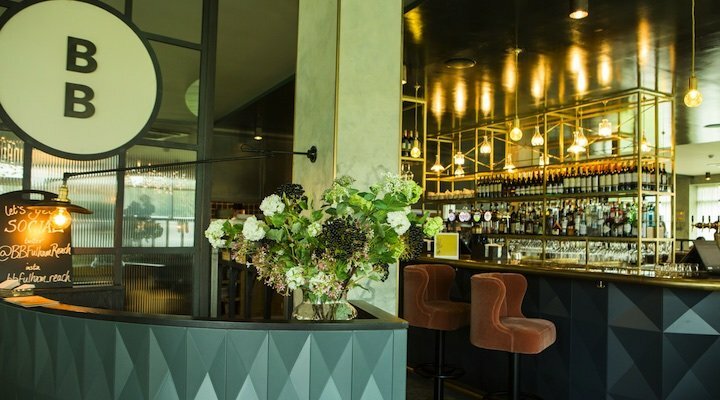 This Fulham venue, for urban river-side dining, combines views, food and design to provide a certain je ne sais quoi, ensuring diners leave compelled to revisit. Whilst some may find controversy in allowing four-legged friends during the day, those taking the pooch for a morning stroll along the river are welcome. Our three course meal for two people, sharing a bottle of wine cost £55 per person + service. 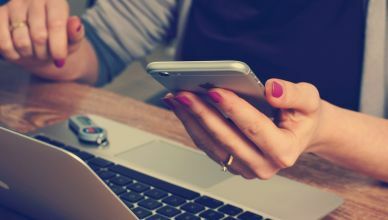 For Londoners who are looking for a restaurant to take visiting parents, in-laws or enjoy a relaxing, upmarket date night, Brasserie Blanc is an ideal choice. For more information or to book, visit brasserieblanc.com.